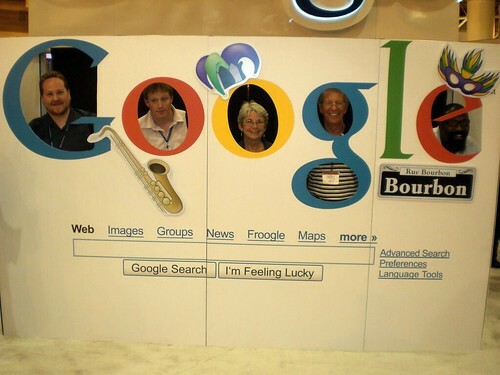 Here’s Google’s video relating their experience at ALA 2006. Included are shots of the booth in the exhibit hall, a little video of the party they held at Muriel’s, and snippets of interviews they did with librarians at the party. You can see the swanky glowing drinks that I talked about earlier. The most amusing thing to me about the picture? Google put these up as a Picasa Web Album, but I’m linking to it from my flickr account. Why? Picasa doesn’t give you easy linkability…I could copy image location and paste in the URL, but that’s not a friendly user experience. Flickr EXPECTS you’re going to hotlink their images, and gives you the URL to do so. Picasa also doesn’t give you an easy way to browse to a specific picture…this was pic 166 of over 200, and when I went back to find it, I couldn’t be bothered to click next picture 165 times. There must be a jump to picture option for usability, guys. What else…oh yeah…no multiple sizes to pick from, so the resolution you get is just what’s there. I love Picasa as a local picture manipulation solution, but Google is a long way from flickr for online experience. Ha. I thought those were actually your photos pasted into the Google logo. The scale is deceiving. It wasn’t until I looked at the photo album that I realized you guys were standing behind the logo looking through it. Cool. I love this image! I hope that they have a similar stand this year in Washington. Can’t wait!